Antwerp is the city on the Scheldt, the city on the river, facilitating encounters and exchanges between people from all over the world for several centuries. The MAS museum collects proof of these encounters, using this to tell new stories. About the city, the river and the port on the one hand. But also about the world. The MAS has many facets, and is teeming with stories and surprises. The MAS has a phenomenally large collection, which to date comprises about 500,000 items, including artworks and utensils. New objects are constantly being added to the collection. The museum uses its entire collection to weave a new narrative, based on five universal themes, on just as many floors. The MAS takes a closer look at power politics and world ports. At how food shaped and will shape today’s metropolises in the past, present and future. And at life and death, of people and gods, in the upper and under world. Moreover, the third floor and the walking boulevard host some fascinating and highly diverse temporary exhibitions. But above all, the MAS excels at connecting all these stories. This is not your typical museum, where you walk from display case to display case. Instead all the stories engage with each other, thanks to the way in which the floors have been arranged and are connected with each other. 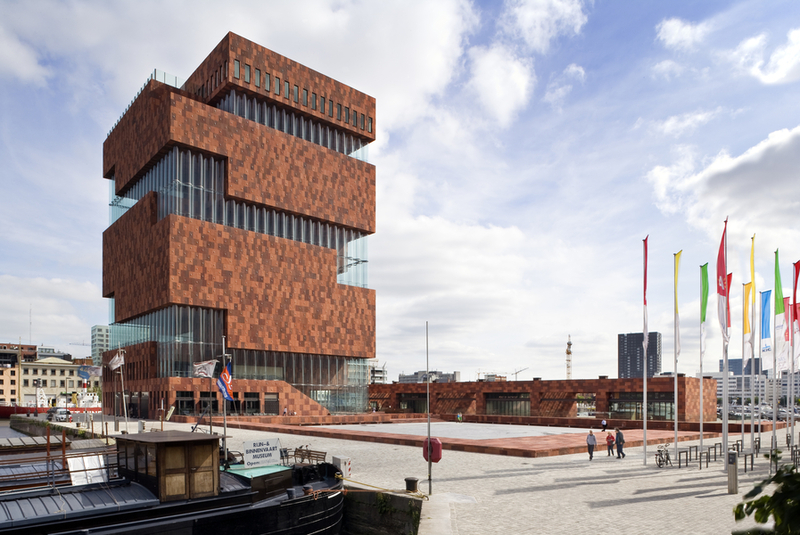 Ensuring you understand Antwerp and the world a bit better at the end of your visit. Visiting the MAS means exploring the building from the bottom to the top. As you make your way up the escalators to the next floor, you discover that the museum is actually much greater than the building. Gradually Luc Tuymans’s hidden artwork “Dead Skull” also becomes visible. But Antwerp also reveals itself to your gaze. En route to the panoramic roof terrace, the city, the Scheldt and the port loom even larger, culminating in a stunning view at 60 metres above sea level. Don’t forget to also take some time and explore the Eilandje after visiting the MAS. Discover what else this hip part of Antwerp, which still feels very much like a port neighbourhood, has to offer. Every last wednesday of the month, you can visit one theme of the permanent exhibition until 19:00. The entrance fee amounts €2. School groups: preorder 7 days before visit.